The Nest Cam IQ is one of the most technologically advanced home security cameras on the planet thanks to its exciting new AI features that allow it to recognize people’s face and send custom alerts accordingly. It also costs $300, which is way out of most people’s budgets. 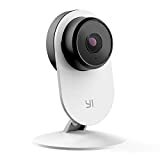 If you want something with similar AI features at a fraction of the price, definitely check out Yi’s new YI Home Camera 3. At just $59.99 a pop, you can literally buy five of these awesome cameras for the price of one Nest Cam IQ. DON’T GET BOTHERED: Schedule on and off time of your 1080p-FHD resolution ip camera for each day of your week. Turn off the blue status light or set a pin (FaceID on devices with FaceID) to lock your house camera. You can set to receive video and photo footage with your activity alerts. SOUND TRIGGERED ALERTS: Advanced sound analytics detect abnormal sounds like baby cry or shattering glass. Use as reliable baby monitor with camera and detection abnormal sounds between 50 dB and 90+ dB. That’s from regular conversations up to harmful noises. Supports intercom or hand-free mode to talk and listen simultaneously.